The evergreen Christmas fern which resembles Boston fern, has rich green leaves that grow in bouquet-like clusters. The leaves that cascade from the central roots are spiny toothed which makes them more decorative. They look charming in the shade garden and can be planted in pots and on the ground. They are widely used for floral arrangements. 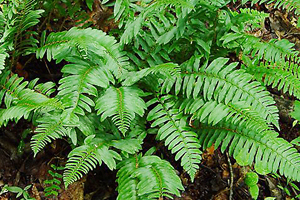 Christmas ferns have 12 to 18 inches fountain like clumps of fronds with leathery, dark green, lance-shaped leaflets. The fronds of these ferns vary in length from 2 to 3 feet. This fern does not spread, however clumps will increase in size over time. Sori (clusters of spore-bearing organs) appear on the undersides of the pinnae only at the ends of the fronds. Christmas ferns can be propagated through division and spores. It is done by replanting the divided rhizomes just below the soil. It prefers humus-rich, loamy, moist but well-drained organic soil in part to full shade. They will tolerate a fair amount of sunlight if the soil is kept reasonably moist. There is no serious insect or disease problems. Creepers are very much similar to climbers, like money plant, monstera, rangoon creeper, passion flower, they need support to grow upward or they have weak stems. First thing is that the plant which u r seecting for making bonsai should have strong stem, ferns do not have the same characteristic, in other words u cannot make a bonsai of a fern.